Shallower gradient, 48º steps for a safe forward facing exit. Large working top platform, 800mm (W) x 1200mm (L). Removable platform chains for access. Extra wide expanded steel treads, 750mm (W) x 180mm (D). Fitted with lever operated retractable castors, and a safety bar to deter access to steps when in the mobile position. 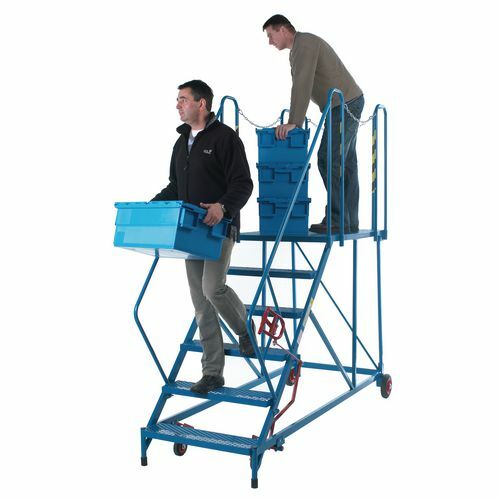 Working at height for long periods of time is challenging and impractical on a regular step ladder, by providing a large platform for the user to work on it will help them work more comfortably and efficiently. Our easy slope access platforms have a large working top platform which is 800mm wide by 1200mm long. The removable chains allow you to access areas from three sides of the platform. 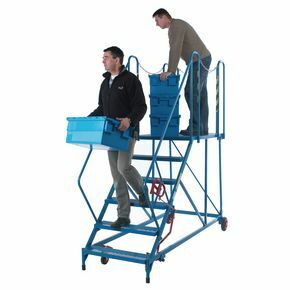 The easy slope 48 degree incline provides comfortable access to the platform with extra wide expanded steel treads. They are fitted with lever operated retractable castors and a safety bar which deters access to steps when in the mobile position, making the unit easy to move and safe while in use. You can be confident these are quality products as they are certified to EN131 and GS approved. These steps are available in a galvanised or painted finish and come in a choice of four platform heights; 690, 920, 1150 or 1380mm. Our easy slope access platforms offer a comfortable and safe area for the user to work at height. They come with a 12 month guarantee and FREE UK Delivery.